Not long ago, I wrote of the mad love I have for my CSA. Though I adore the giant bags of fresh, delicious produce from a farm right down the street, sometimes the bags are a little too giant for our two-person household. In the summertime, I can only eat so many tomatoes and jalapeños before I’m tomato-ed and jalapeño-ed out. With several weeks of CSA bounty accumulating in my fridge and no desire to make fajitas again, I knew I had to perform triage before the produce went bad. It was time to call in my secret weapon: my brother, Chris. In addition to being my favorite brother (okay, my only brother), he’s also the best chef I know. While I inherited the DNA that evolutionarily dooms me to burn toast, he got all of our mom’s culinary skills — and more. I love my brother’s homemade salsa and steal several jars from his pantry every time I visit him in Wisconsin. It’s fresh, flavorful and packed with ingredients I can actually pronounce, instead of the who-knows-what in most supermarket varieties. What’s more, it doesn’t cost five bucks a jar. In my family, where salsa goes on everything from breakfast to snacks to salads, that’s a lot of savings. Every year, Chris and our mom gather a giant bounty from local farms. 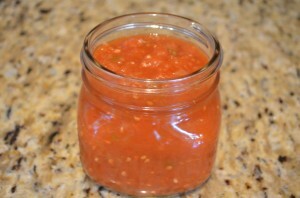 They spend two days peeling, dicing, simmering and canning jars of homemade salsa by the dozen. Of course, I do my part — drinking root beer at the kitchen table and sneaking tastes from the pot when they’re not looking. Like I said, I don’t have the genetic programming for kitchen work. Before I could retort about the “idiot” comment, a message from my brother appeared in my e-mail inbox with his salsa recipe. And…well, he was right. I was surprised to learn that making homemade salsa is not that hard. I’ve made several batches on my own, and I’ve yet to screw it up. Take advantage of a bounty from your CSA, home garden or the farmer’s market. Whether you’re a whiz in the kitchen or an idiot like me, you’ll love having the flavors of summer in the pantry year-round. 1. Combine all ingredients in a large kettle and stir. Bring to a boil, then reduce heat. Simmer until salsa is a consistency you prefer (usually 3 to 4 hours, depending on water content). 2. If you prefer a less chunky salsa, run through food processor before serving or canning. 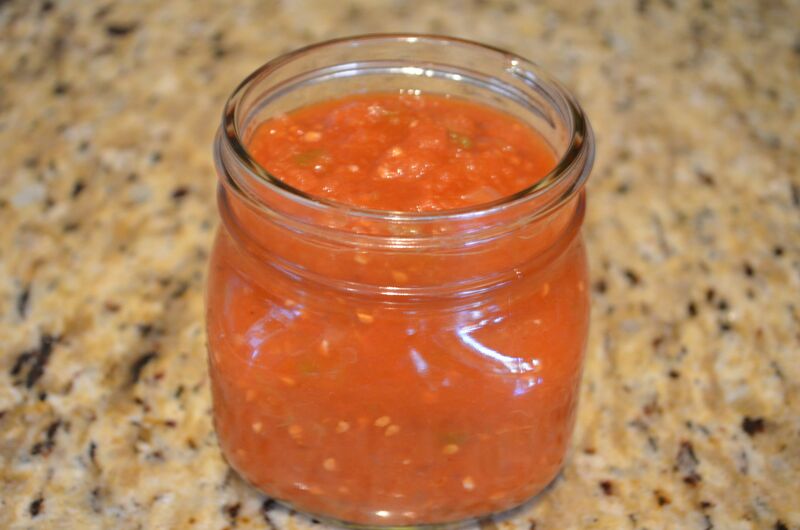 Don’tcha wish your salsa was hot like mine? One thing we always keep in our household is salsa and guac. Salsa is great for topping almost everything. It’s super easy to make. I love the tomato based salsas but mango salsa is another favorite of mine. Thanks for sharing your recipe!